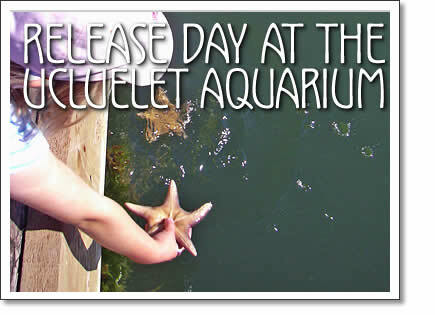 On the 16th of this month, the Ucluelet Aquarium will be hosting its annual Release Party. Beginning at 10 am, all those interested in participating will be invited to help staff and volunteers return the aquarium’s creatures back to the wild. Every crab, fish, medusa and sea slug will return to its home. So will each anemone, sea cucumber and snail. It must be noted that not all our creatures return to the wild in the same form they entered. Dozens of red rock crabs have been collected during the season. Many were caught by local youngsters, who displayed their trapping skills and donated portions of their bounty to our tanks. However, some of these are critters we collect for more than simple observation. The Giant Pacific Octopus (GPO) consumes at least one crab per day. And while our current GPO will be freed a much larger octopus than she was captured, displaying her meant the end of many a red rocker. Dozens of small shore crabs provided the fuel for the visible growth of one of our small red octopuses. Dubbed ‘Kane Jr.’, she has grown from the size of a thumbnail to a golf ball, and can be observed flushing various shades of red and beige as she cruises the perimeter of her tank. To our knowledge, the ‘catch-and-release’ concept is unique to the Ucluelet Aquarium. In order to run the aquarium in this way, new specimens must be captured anew each year. Sand, shell and gravel mixtures must be collected and cleaned to create the bases of each exhibit. Rocks must be collected by divers. Habitats must be permitted to settle and the pressure of the water pipes into each display adjusted so that each display caters to the flow and oxygen requirements of the organisms within. In some tanks, displays have been established and tweaked to the point that they have become self sufficient. Any algal growth is consumed by chitons, turban snails and sea cucumbers. Hydroids feed the sea slugs. The wastes and deaths are consumed by other organisms and on the cycle goes: one micro-ecosystem extant within glass perimeters. Why go through all the trouble then, of re-establishing displays every year? Why endure the many weeks of cold collecting every February and March? The catch & release system has its benefits. Because of the small size of the aquarium, ‘catch & release’ benefits everyone by allowing a greater variety and number of creatures to be shown than if the exhibits were static. For our season’s pass holders, some of who visit almost every week, this means there’s something new to be experienced or viewed every time. It is also means that the creatures released will mate, re­produce and feed other organisms. This fuels the complex webs of the local ecosystem and provides us with more organisms to learn from and observe in the future. It creates a lower impact educational opportunity. Hundreds of small clams and cockles will be released into the bay, after having developed in the substrates of our tanks. Arriving as plankton, they and many organisms develop within the aquarium, undergoing many changes until they are visible growing upon rocks, seaweeds or other organisms, or free swimming in the water column. Some of our organisms will experience the wild for the first time in their lives. For the dozens of shiner perch born during mid August, the release party represents a new experience, a very first taste of the larger ocean, an increase in territory, prey variety and number of predators. There exists many a rockfish out there that would greatly enjoy a quick shiner perch snack. If you’d like to join us (and we’d love it if you would) the release will take place in front of the Aquarium entrance, by the Whiskey Dock in Ucluelet. Please bring a mug for hot chocolate, a pail to carry your wee fish, clam, crab or rock, a camera to take a photo for your mom, and a rain jacket, because, well lets be honest, it’s October. Costumes are encouraged, and all are welcome. If you’d like to volunteer, please contact Laura at lgriffith.cochrane@gmail.com or stop by the aquarium. Until October 16th the hours are 11am - 5pm every day. Rain or shine. There will be a prize for best (or worst) sea creature related joke. To get you going, here’s Kane’s: ‘What do sea monsters eat?’ … “Fish and Ships”. Laura Griffith-Cochrane is the assistant curator at the Ucluelet Aquarium. She has her eye on some warm-water marine specimens this winter. O'Neill CWC 2010: Re-Pete Devries? Ucluelet Aquarium holds its annual release party on October 16, 2010 this year, when the inhabitants of the various habitats get released back into the ocean.